This unusual "4-8-4" was actually a duplex drive on a rigid wheelbase (unlike articulated or Mallet-type locomotives). The result was a 4-4-4-4; the front two axles were driven conventionally from the front, the rear two had their cylinders behind them. The wheelbase for each set of two axles measured 6 ft 7 in (2.0 m). Splitting the drive allowed the use of shorter, lighter reciprocating or rotating components such as main rods and side rods and more effective counterbalancing. Permissible curve radii at normal speeds was 13 deg, at slow speed 18 deg. 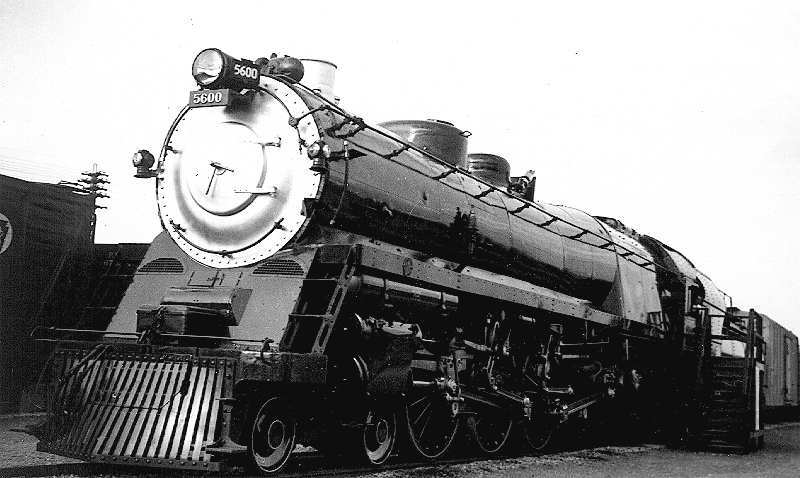 This was the only B&O engine with duplex drive; see Pennsy Q1, Q2, S1, and T1 classes for other examples. Note the small piston diameter, the oddball stroke, and the high boiler pressure generated in the extremely long Emerson water-tube boiler. The water-tube firebox was perhaps the most unusual part of the design. Not a completely unheard of approach in locomotive design, surrounding a fire with dozens of small tubes and running water through them was far more common in stationary steam engines or relatively spacious fire rooms on board ships. Over a large and wide grate, 83 small tubes on each side, each measuring 2 1/2" outside diameter and measuring 6 ft 2 in (1.88 m), met in a manifold created a furnace that had a huge amount of direct heating surface area and eliminated stay-bolts as a maintenance item. Sagle contends the N-1 met its requirements in an innovative and satisfactory way. Completed in May 1937, the 5600 (the N-1 designation was rarely used) went into service on fast passenger trains and fast freights. And here, says Sagle, the N-1 ran smack into a competitor its design couldn't answer--EMD's EA diesel-electric locomotive. For all the advances, a production-quality diesel on two A-1-A trucks quickly proved to be a better solution to fast passenger haulage demands, at least as far as the B&O was concerned. See an extended, entertaining dialogue among several thoughtful ferro-equinologists on duplex setups in general and the Pennsy engines in particular at on duplex setups at Railroad.net's thread  (last accessed on 22 March 2015). Begun by Allen Hazen on 7 August 2007, the discussion ranged over several different US duplex designs and delved in great detail.